I shuffled into the kitchen for my morning ritual of grinding beans and starting the addictive I.V.-drip of coffee. From the bay window came sufficient light, filtered by the pine trees, to keep me from having to flip on the recessed spots overhead. Then I glanced around, half-smiled to myself, and thought, “Well, you showed up anyway.” Smugly, but lightly dancing on the morning rays was the little sprite Newstart, which before I could blink, leapt and raced along my optic nerve, slipping defiantly into my frontal lobe. Logically, there’s no reason a change of calendars should elicit resolves to improve or initiate changes. The package of responsibilities, habits, and necessary tasks you set down on December 31 is the exact same load waiting to be shouldered the next morning. And yet, barefooted and unshaven in the kitchen, I actually felt something different. I felt a Newstart within me, and before I could clobber my thoughts with cynicism, I was entertaining a list of goals for the new year. The most disgusting aspect of it all was my reluctant admission that the feeling, full of possibility and hope, had “rightness” written all over it. With the bitter warmth of the coffee finally pushing me into alertness, I began looking for some compromise. I was determined not to be lured by the tradition list of resolutions, those tramps that smile seductively promising to be your savior right before they morph into spectral stalkers. But something was needed. Newstart had dug in, pinging my synapses with that fresh feeling I could not, and honestly would not, shake off. So I have resolved that my resolution this year will be to keep Newstart with me. I’m not sure how I will accomplish this, but I plan to greet Newstart in my daily morning rituals. This morning Newstart was my uninvited gift, but I know most mornings, perhaps even tomorrow’s, I’ll have to hunt for her. I have a sense of the places to look, readings and reflections, prayers and perspectives, yoga and yogurt, to name a few. The important thing I suppose, is to own the search. And with practice, maybe I can prompt others to find her as well. I am so disappointed with Halloween. I know it is second only to Christmas for commerce, and I'm not against helping the economy. Maybe I should, but I don't oppose Halloween on religious grounds, nor because of the gruesomeness of the movies, costumes, and decorations. It's seeing the kids totally miss the meaning of Trick or Treating that bothers me. Let me tell you what happens in my neighborhood. I live in a subdivision a couple of miles out of town. Carloads, truckloads, and trailerloads of kids (most of whom were teens) are unloaded at the entrance of the subdivision to walk door to door with their pillow-case sized bags. At the door, sometimes you get the traditional "trick or treat" but often the child just stands there with the bag open. Again, sometimes a "thank you," but often they just turn and run on to the next home. No need to guess who it was, you wouldn't know them anyway. I was glad when the last of the candy was given away, and the front door light went out. The whole drama of the exchange is gone. The meta-narrative of good and evil, power and surprise is missing, leaving the event crass and meaningless. Trick or treating is that mysterious time when children, with costumes, become something more than who they really are, curious strangers who have the ominous power to extract a ransom from you. I can idealize a time when Trick or Treating was an enjoyable evening for a community. You didn't go to the store and buy bags of individually wrapped refined sugar, you made treats to give out. The neighborhood kids came around, often in family groups and you greeted people you knew, chuckled at their homemade costumes, and guessed who it was. The transparent threat of "treats or some trickery" was thwarted by sending them on with something good to eat. Alas! My idealized version is just that, idealized. For me, however, I've decided that next year I'll just stick with the church carnivals with their "trunk or treats," and simply leave a twenty pound bag of candy on the front porch steps at home. My wife and I went to a banquet last night, a nice affair. She looked great, and I was dressed in my nicest black suit. But when we got to the door, I immediately knew I was under-dressed. All the men I could see were wearing tuxedos, but nothing on the invitation said, “Formal.” Oh well. The incident reminded me of a dinner a few years ago in Jerusalem. Our traveling group was to have a nice formal meal at the hotel before flying home the next day. When you’re touring sites in Palestine, formal means a tie, and, if you have one with you, a jacket. But one guy showed up in a tux. I immediately thought how he’d had to haul that tux with him over the past ten days of touring. And then I thought how awkward he must feel being so overdressed. I felt awkward for him. But maybe he was one of those guys who doesn’t care what others think. Maybe, but who really is like that? I’ve wondered what it is that makes us want to “fit in.” It’s not just peer pressure or social cohesion. Nope, for me it’s more primal than that – I simply don’t want to look stupid, especially in public. By blending in we lower the risk of being noticed, questioned, and having our deficiencies pointed out. However, if you don’t know what’s expected, if you don’t know the unwritten rules, or if you haven’t ‘been there before,’ you either have to have a lot of chutzpa, or like me, be ready to make a quick change. Think about this when you invite someone to church. Often visitors are concerned about appropriate dress, as well as what will be expected of them. They want to “fit in.” However, what if the goal of worship is not to make everyone “fit into” a uniform expectation, but to stretch us so we fit in with God’s diversity? Cavorting in the dark waters. A threat, and turned her back. Of beauty, and apparently, of flight. As the layered, symmetric ones. Bathing my own tangled wounds. Have invested chunks of time lately into missions - Salkehatchie youth mission camp and taking a team to Bombita, Dominican Republic. So this week have been reflecting on what I've learned from it all. I was helped yesterday in my devotional time with a passage by Simon Tugwell (in his book, Prayer) on the poverty of God. But I'll return to that in a minute. In preparing the team for the DR, I stated repeatedly that we have three objectives. First, we are making ourselves available to God in a different (new, for some) way, and we should pay close attention to the work God does with our hearts on the mission trip. Secondly, we go to demonstrate God's love and our love in a ministry of presence, letting the people there know we care about them. Finally, we will do some physical labor to help the ministry there accomplish its goals. The order of the objectives is crucial. Most folks want to reverse the order, focusing on what we're doing to "get done." Indeed, several times on the trip we wanted to make the third objective the first priority. Like most Americans, we were set on "fixing things." When we saw the lack of clean water in the Hatian village where we were working, we began planning how to get a micro-desalination plant installed there. When we noticed the lack of a wholesome diet, we brain-stormed how to introduce vegetable gardening. As we observed the subsistence housing, we talked about future trips to work on particular homes. We are easily deluded into thinking the most important things we have to offer are our "know-how," our "get-it-done" energy, and our vast resources. A team member said during a morning devotional that she felt bad because, while our work on the school was important, she felt that there was so much more we could/should do for the people in the village. Guillermo, a local worker, replied, "You have done more simply by coming here than you realize. Your presence tells us you care, and gives us hope." This is why, if we keep clamoring for things we want from God, we may often find ourselves disappointed, because we have forgotten what we may call the poverty of God. We had thought of God as the dispenser of all the good things we would possibly desire, but in a very real sense, God has nothing to give at all, except himself. God wants to give us God's self, but we'd rather have the "things" God can provide. Might this have something to do with "You shall have no other gods before me"? And how do we carry an awareness of the poverty of God not just on a mission trip, but in our daily lives? My wife left yesterday, driving nine hours to spend a day with a friend who is in the last stages of a battle with cancer. She said before she left that she didn't know what she'd say, what to do, or what to expect, knowing this would be the last time she'd be able to see our friend alive. In a very real sense, she has nothing to give at all, except herself. And if we could just learn and live that, perhaps we'd begin to understand the poverty, and power, of God. Got to baptize a beautiful little girl today, taking her from the arms of her mom, as the father stood there with their three other girls. I told him (and the congregation) that a friend of mine says it takes a special kind of man for God to entrust with daughters, and that it was obvious he was such a capable, trustworthy man. While those words could just be bullfluff, I know the man well. He is great father and a mentor for one of our boys Life Groups. But I was thinking, does it take something extra to be a good dad to girls. Not having a son, I'm really not in a position to make a comparision. Maybe the question should simply be, "What does it take to be a good Dad?" But I remember reading a book some years ago called "Bonding," by Donald Joy. He devoted a chapter to the important role a dad has in a daughter's developing sense of herself. Joy says no one can take the father's place in giving a daughter a safe place to grow in her sense of femininity, and in her self-respect. Sounds like a tall order (and they don't come with instruction manuals!). Maybe you do what you should do with every child - balance good expectations with affirmation and be unwavering in your love and belief in them, and in the case of girls, add an extra dash of patience. As most dads who take this role seriously know, I'm sure my girls have taught me more than what I might have taught them. And yea, I still haven't gotten over my goofy amazement that I get to be their dad. The Annual Conference of the SC United Methodist Church ended Wednesday. With all that occurred, it was, in a word, uninteresting. That of course is just my take on it. And I don’t name it such as a complaint, just an observation. A lot of people worked hard to make things run smoothly and that’s exactly what I told the Bishop when she asked Wednesday at lunch how I thought Conference was going. “Smoothly,” I responded. Presiding over our proceedings, she did her part well, even getting everything done ahead of schedule. She assigned the preaching and Bible study times to our new church pastors and that was good. Hearing their enthusiasm and commitment to win new converts was inspiring, but it also was somewhat like when the foreign missionary comes to speak at your church. You’re thankful for the work they are doing, but you realize they are in a different world than yours. We recognized a lot of churches and people for excellence in ministry over the past year. We again took Tuesday afternoon and did acts of service in the Florence community. We voted on the Constitutional Amendments (voting down the ones related to changes for the worldwide nature of the church by a consistent 85%). We commissioned and ordained some great new ministers, and we passed the necessary budget and reports, in general with little discussion. So, we did some good things over the four days. Maybe that’s all Conference should be, that and the time for fellowship, (catching up with folks you care about but rarely see). But a part of me is nostalgic. I “grew up” in the Conference when the business, the budget, and the social stance of the Conference were often hammered out on the Conference floor. Breaks were a time to discuss strategy and the amendments we’d make motions. There were “characters” who interspersed humor or called us to observe parliamentary procedure with “points of order.” There were the wise leaders of the Conference, often not agreeing with one another or the presiding bishop, but guiding us with experience and vision. Now it is obvious the “work” is done elsewhere, in committees and cabinet meetings, and Conference is there to receive the reports and give official approval. And maybe that is the way it should be. A new generation of leaders affirms the real work of the Church is done not when we gather as delegates, but when we scatter into fields of service. So I guess Conference should then be a time to celebrate, renew relationships, and worship. But sometimes I miss sitting on the edge of my chair waiting to gauge the next speech in a contested debate, and hoping and praying the Church body makes a wise decision with its vote. Heard some staggering statistics yesterday. In South Carolina 50% of the births are to unwed mothers. In Sumter County, the percentage rises to nearly 70%! What? And what is equally amazing is where I heard the figures - in a happenstance visit with an obstetrician who probably is in her late 70's, and yet who is mounting her own campaign to address this social delimna. In retrospect, I don't know which had more of an impact on me, the high number of children growing up without a father figure, or the social concern of Dr. B. As for the first, Dr. B. says we talk about a lot of social issues, truancy, gangs, high cime rate, number of males in prison, number of children living in poverty, etc., but we don't talk about the etiology (the causes), because it isn't politically correct. The truth is that we need to put emphasis and incentives into encouraging and preserving stable families. She recommended a 1995 book by David Blankenhorn, Jr. titled Fatherless America (which I have ordered.) How do yo even begin to address this? Now, for the greater impact, this successful doctor, well into retirement, has a heart for "the least of these." She spoke to a state newspaper reporter about all this and the reporter questioned her statistics. So she went to the state agencies and researched it on her own. She's spoken to several representatives and state senators, and even the governor, trying to highlight the concern. And locally she has been connecting with male African American role models who "can give her insight to the causes." I left that chance encounter inspired. I personally am not feeling like Elijah, who in his depression complained to the Lord "The Israelites have rejected your covenant, broken down your altars, and put your prophets to death with the sword, and I am the only one left." (1 Kings 19). But I did think of the Lord's response to Elijah, reminding him that thousands were still faithful. And I thought of Dr. B. as one of God's thousands, with faithful eyes to see what Christ might see, an open heart to care, a sharp mind to seek truth and answers, and the courage to believe she can make a difference. In many amazing ways the Kingdom of God is in the midst of us. Making small talk at a wedding reception recently a friend and I realized we have in common an odd bit of history. We are about the same age and we both know we are probably here because President Truman decided to avert the invasion of Japan by dropping the atomic bomb. How can this be? 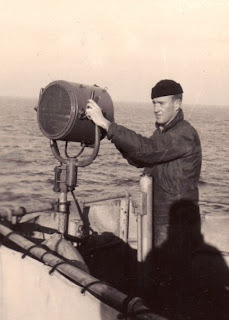 My father was a signalman in the Navy. At the end of the European theater of war, he was sent with other selected signalmen to train for the invasion. They were to be dropped offshore, were to get on land the best they could, dig in, and help direct the invasion from their vantage point. The Navy expected a survival rate of 1 out of 10. My friend’s father was an Army sergeant. After time in Europe, he was assigned to a special force being made up for first wave of the invasion. I don’t know what survival rate was expected for this, but pretty sure it was slim. Anyway, they were in training at bases in California when the news came of the atomic bombing of first Hiroshima and then three days later, Nagasaki. Six days after the second bombing, Japan surrendered. This post isn’t made to offer rational for the use of nuclear weapons. I cannot imagine the horror they created and pray the world will never see them used again. But here on Memorial Day as I think of so many who have died in service to our country, I do give thanks that two young soldiers got the chance to live, and to become dads. And it reminds me that we who live peaceable lives owe a debt of gratitude. My friends and family know I have been deeply involved in the Aldersgate Special Needs Ministry here in S.C. Our goal is to provide secure dwellings for adults with developmental disabilities. I have been chairman of the Board for the past year and it has been a job dealing with governmental agencies, regulations, revenue sources, worried parents, disgruntled board members, etc., etc. - especially since I really have no experience in the gov regulation area. Fortunately I serve a church where they don't worry about the days I give to Aldersgate, though I do try to schedule most of that on my days off. Honestly, there have been several times over the past couple of months when I've asked myself why. There's no one making me do this extra work. It's frustrating, and it's all volunteer. Well, yesterday I got my answer. In the past two months we finally got both our homes operating. The women's home has six residents and the men's home has one resident, with three other young men in process to get the funding lined up. I went by the women's home for a visit yesterday, my first since the residents had moved in. What a good move for me. I was greeted by two of the residents and their first words to me were: "We love our home!" I met with some of the staff we've hired to run the house, but the residents cut that short, wanting to show "their home" to me, and to show me how they'd decorated their rooms. You could tell they were so comfortable there, and with one another. One of the young ladies usually speaks in a whisper, but the other girls knew that and encouraged her when I asked her a question. You could readily tell they were already becoming "family" for one another. We were worried about the transitions these girls would be able to make from their families. What's happened is that the residents have told their parents they don't have to come visit and check on them. They are enjoying their new found "independence." There are many times in ministry when we work and serve and never get to see the fruit of our labors. Wow, am I fortunate. The experience yesterday does make the six year journey to get there feel so worthwhile. It has been a blessing to work with some dedicated parents and board members over those years, and to witness how so many people have given time, effort and resources to this cause. There's still a lot of work to do, and a lot of money to raise, but now I know in a new way what a difference it all makes. Thanks be to God! Trying to keep an open stance to life, taking note of moments before they merge into the blur. Glad you stopped by. Leave me a comment with your musings, if you like.